If you’re backpacking in Mexico then you’ll find the prices pretty low, especially in comparison with travelling in other regions like Europe or Australia. However if you come to Mexico and find yourself going out to every spring break club event, drinking your weight in Margaritas and living it up at beach clubs every day, you’re going to get through your budget before you can even say ‘burrito’. 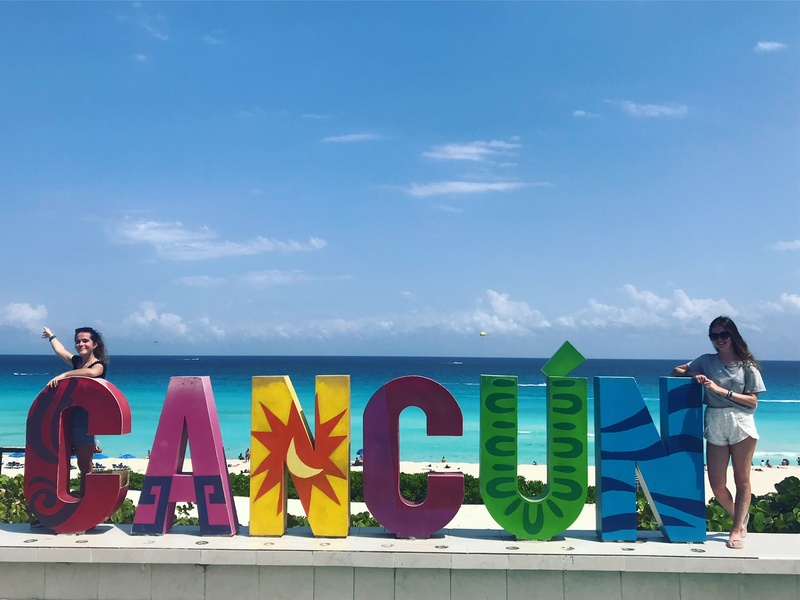 I thought I’d write this post with a few money saving hacks that I used so that you’ll be able to have the time of your life in Mexico without spending all your cash in the process. If you can drive then renting a car will make your life so much easier and save money in the process. Loads of Mexico’s best beaches are quite far out and the only option can be to get a taxi sometimes which soon adds up. Renting a car can be cheaper in the long-term, especially if you share with other people and split the costs. The other option is renting a bicycle. We did this everyday in Tulum as it was only 100 pesos for the day compared to the only other option of getting to the beach, a taxi costing at least 200 each way. Hostels can have a bad rep but the hostels we stayed in Mexico were fantastic. They’re the cheaper option in comparison to hotels and usually offer way more in the way of services for travellers. You’re usually looking at paying around 200 pesos a night for a bed in a dorm and this often includes free breakfast, tours as well as laundry services, a bar and a common room to relax and meet other travellers. Loads of hostels, apartment and Airbnb’s have kitchens so save some money by cooking. Although by Western standards, prices are cheap in restaurants, (you’re usually looking at around 200 pesos for a main), it can soon add up and it’s only when you go and get enough food for a couple of meals from the supermarket for 60 pesos that you really how much money you can save. Plus cooking in hostels is a good way to meet people, and I can’t be alone in feeling that going grocery shopping abroad and cooking your own food is fun. Part of the fun of travelling is meeting so many different people, and it actually pays to strike up conversations too. If you’re travelling by yourself then not only is it more fun to do things with other travellers but you can split the costs and save money in the process. The other great thing about talking to people is getting tips on the area you’re in or for the places you’re going to next. travellers and locals are the best source of information on cheap transport hacks, local eats and budget hostels, so don’t be afraid to be nosey. Portions in Mexican restaurants can be massive so don’t be fooled in to thinking you have to order everything at once. Why not share a main and get a side of guacamole, you can always order more if you’re hungry. Because it’s so Americanized restaurants are used giving takeaway containers if you order too much so if you’re staying somewhere with a fridge then take back your leftovers for another day and save the cash and the food waste. The second you veer off the main tourist trial in Mexico you’ll see the prices drop. The Yucatan Peninsula is one of the most expensive parts of the country so consider lesser known regions or smaller destinations if you want to save the pennies. Even in the Yucatan, halving your spending costs is usually just a case of heading in to the backstreets and generally the less impressive looking, cheaper restaurants are the best. Don’t take taxis, if you want to travel between destinations in Mexico then take a Collectivo or an Ado bus. Collectivos are usually the cheaper option but these can be harder to negotiate whereas Ado buses are very comfortable, reliable and don’t cost too much. You just pick these up from the Collectivo or Ado bus stations and pay for your ticket at the counter. It’s worth double checking the times before you go. Some routes run regularly like Playa Del Carmen to Tulum, but others like Tulum to Valladolid are less frequent. One of the biggest money saving hacks I learnt is that its better to stay in one place and do shorter trips from there. You will find you waste valuable time and money on packing, getting the bus, moving hostels, if you move about all the time. Its better to base yourself in one place for a few days than move about all the time. If your hostel runs tours then its usually easier and cheaper to do one of those. We ended up doing a tour with our hostel in Tulum that encompassed Chichen Itza, a cenote Valladolid in a day which saved us loads of money in the long run. If you speak Spanish then you’ll find it so much easier to travel around Mexico. Not only is it easier to communicate and negotiate, there are often cheaper prices listed for Spanish speakers so you’ll really reap the benefits. Either way its a good idea to get a few phases under your belt, even if it’s just to make your life a little easier when you get there. Let’s be honest, having as many Magherita’s as possible is high on your priorities in Mexico right? However there’s no need to ever pay full price for your drink. Most restaurants and bars in Mexico offer happy hour drinks. A lot of hostels also offer similar deals. In fact our hostel, Hostel Che in Tulum, even had a ladies night which meant that every night from 11- 11:30 (meaning free drinks for girls), and then the local bar always handed out free drink vouchers, so we managed to have a night out for virtually nothing. Also its the norm to get a free drink voucher when you check into a hostel in Mexico so save the cocktails for then. If you’re travelleing from further than the US then perhaps the thing that’s putting you off Mexico are the flight prices. You can spend loads on a return flight to Mexico, however if you shop around there are lots of cheap deals to be found. I always find Skyscanner is good for flights as it lets you compare prices over the whole month. Generally speaking if you break up your flight it saves money, so look at flights going via the US. When I checked it was cheapest to fly via Housten or Ft Lauderdale. On a fluke my friend managed to find us some really cheap return direct flights with Tui which left from Manchester to Cancun for £200. I ended booking this and wasting the return as it was cheaper than a one way. Sometimes it pays to look at prices from other regions in the UK and then just pay for the coach to get there.